Revised Board Game Game Highlight: Flick ‘Em Up! Split up into two gangs and prepare to face your rivals in the purest of Western traditions! 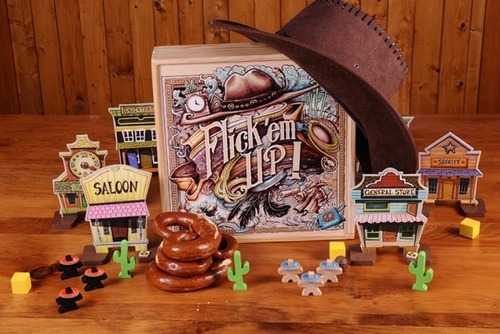 Flick’em Up is an exciting dexterity board game for 2 to 10 players. Will you join the Sheriff and his gang or will you be a part of the fearsome Cooper clan? Each character in the game is represented by a wooden 3D figurine with a removable cowboy hat. Before every game begins, you’ll choose a scenario, build a classic Western town and begin the shootout!